Define Image > Guides > New Guides (by Percent) at 25% 50% 75% horizontal and vertical resp. To export the images in ready to use HTML code we can alternatively use a Slice python-fu script made for this purpose. As far as gimp goes, I have no idea how to make multi-page posters or slice image, but that answer was already given, so that's good. I was curious, since this apparently has win, mac and linux versions. It looks like source forge is down at the moment, so I had to google Poster Razor mac, to download it. Windows version can be downloaded here. Overlap feature combined with the easiness of the application makes me wish I had known about this application before. Of course it's only beneficial feature if you don't want any gaps between your paper sheets. One big minus ( but at the same time very irrelevant minus ) seems to be the very same overlap feature I just praised. If you want to get creative and leave gaps between the sheets of paper, you have to set overlap to zero, but that screws up the preview. Overlap seems to be the thing that visually divides your picture in the preview, so when you set that to 0, you can't see how many slices you got and what it looks like. It is easy to get around ( which is why I said it was irrelevant ): Set small overlap ( like 1mm ), go to the next page and slice up that image aaand then come back to overlap and set it to 0mm again. So it's not a big deal. This will definitely be the application I'm gonna use if, I want to make multi-page poster again. The first thought that came to mind was Block Posters. Only downside being that 1MB file size limit. I have used it, and it does work pretty nicely. I believe there are other sites/applications like this out there. In older versions of Acrobat Reader, there is "Tile large pages" option. 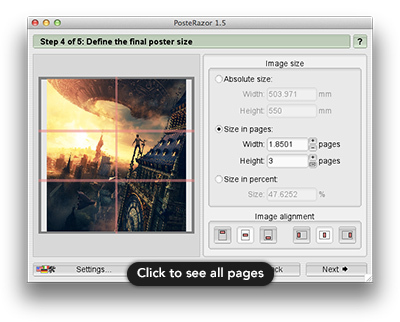 Modern versions have "Poster" tab in the Print window. Has overlap feature, which is super useful if you don't want to leave gaps between your sheets of paper. Right click the document with slice tool and choose "Divide slice"
If you happen to have photoshop, this is pretty fast thing to do and semi handy because you don't have to leave the application to do some image editing. Off the top of my head I can't remember how, but it is doable. See also the ofn-tile script. It cuts a layer into tiles of equal size, and saves them to file using a user-defined name pattern. Not the answer you're looking for? Browse other questions tagged gimp crop or ask your own question. How can I break up a picture in three segments for separate framing? 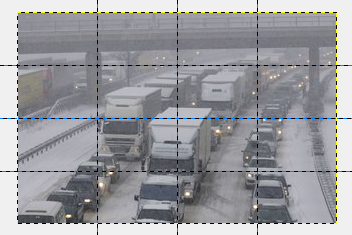 how to split an image with a grid and export automatically every frame of the grid in a single file in photoshop or illustrator? How to explode image into multiple smaller images? Are Gimp's template sizes correct? Modify images as an assembly-line? Is it possible to use the same layers in multiple files?